1. Declare worthy of belief, the visions of the shepherd children in the Cova da Iria, parish of Fatima, in this diocese, from 13 May to 13 October, 1917. Yet despite the fact that Fatima received official approval in 1930 and has been subsequently recognized by the Popes themselves (see “Approvals by the Popes“), there has nonetheless been a consistent attack on Fatima, especially from those within the Church. This attack from within has relentlessly served to undermine Our Ladys Message, which is attacked largely because it opposes the modernist and ecumenical strides being taken by many Churchmen. Outlined here are some of the principal examples of the deliberate attack made on Fatima from those within the Church. Beginning in 1944, the most insidious assault on Fatima was led by the modernist Belgian Jesuit, Father Edouard Dhanis. Father Dhanis began his attack on Fatima in 1944 by publishing two long articles on the subject. While these articles appear at first to be written with prudence and contain numerous precautions, the principal thesis of their author is clear: Father Dhanis accepts parts of the apparitions of the Blessed Virgin to the three children in 1917 as authentic; however, concerning the parts of the Fatima Message that were published later, he expresses doubt as to their authenticity. These include the apparitions Sister Lucy received at Pontevedra and Tuy. Despite the fact that the entire Fatima Message is truly an indivisible whole without contradictions, Father Dhanis divided the Message of Fatima into two separate parts, “Fatima I” and “Fatima II.” According to Dhanis, “Fatima I” refers to the cycle of apparitions of Our Lady in 1917, which he grudgingly admitted to be authentic. However, he categorized all of the aspects of the Message that Sister Lucy revealed after 1925 as “Fatima II,” which he undermined and attempted to cast serious doubt upon by questioning whether they might have been an “unconscious fabrication” and “embellishment” of Sister Lucys. Aspects of the Fatima Message that Fr. Dhanis suggested were contrived by Sister Lucy were: the apparitions of the Angel in 1916; parts of the Secret that include the vision of hell, devotion to the Immaculate Heart of Mary, and the prophecy of World War II; the “night illumined by an unknown light”; and the role Russia was chosen to have in the punishment of the world. He also scorned the idea that Our Lady would ask for the Consecration of Russia, an act he considered to be “practically unrealizable” and “morally impossible” because it would be too offensive to both the schismatic Orthodox and to Russia itself. Father Dhanis refused to study the official Fatima archives or consult other documents made available to him by the Bishop of Leiria. He also refused to go to the Carmel of Coimbra, to interrogate Sister Lucy himself. Finally, when his thesis on Fatima was refuted numerous times by reputable Fatima experts, he evaded the important issues and would not address their main arguments, so that he would not have to withdraw his false thesis.2 To put it in a nutshell, Father Dhanis refused to examine the truth of the matter; he was neither a scholar nor intellectually honest. Though responses were made to his criticisms, Fr. Dhanis work became the reference for the adversaries of Fatima, and in progressivist circles he emerged as the leading “expert” on the subject. Father Dhanis never retracted any of his perfidious criticisms of Fatima, but his writings nevertheless continue to be consulted and referred to, by opponents of Fatima, as authoritative on the matter. For example, in The Message of Fatima, the June 26, 2000 booklet published by Cardinal Ratzinger and Archbishop Bertone, the only cited “authority” was Fr. Dhanis, whom Cardinal Ratzinger called an “eminent scholar” on Fatima. 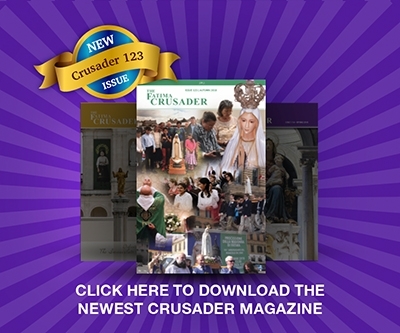 This interview was published with the Imprimatur of the Bishop of Fatima. It was read widely and no one questioned its authenticity. Only after the death of Pope Pius XII (on October 9, 1958) would it provoke a negative reaction. “Father Augustin Fuentes, postulator of the cause of beatification for the seers of Fatima, Francisco and Jacinta, visited Sister Lucy at the Carmel of Coimbra and spoke to her exclusively about things concerning the process in question. But after returning to Mexico, his country  if we can believe an article in A Voz of last June 22, and a translation by M.C. Bragança published on July 1 by the same journal  this priest allowed himself to make sensational declarations of an apocalyptic, eschatological and prophetic character, which he declares that he heard from Sister Lucys very lips. “Given the gravity of such statements, the chancery of Coimbra believed it its duty to order a rigorous investigation on the authenticity of such news which persons too avid for the extraordinary have spread in Mexico, in the Unites States, in Spain, and finally in Portugal. “For the peace of mind of those who have read the documentation published in A Voz and taken alarm at the thought of fearful cataclysms which, according to such documentation, are to come upon the world in 1960, and still more, in order to put an end to the biased campaign of “prophecies,” whose authors, perhaps without realizing it, are provoking a storm of ridicule, not only where they themselves are concerned, but also with regard to things reported as having been said by Sister Lucy, the Diocese of Coimbra has decided to publish these words of Sister Lucy, given in answer to questions put by one who has the right to do so. According to this announcement, Father Fuentes was guilty of completely inventing his account of Sister Lucys statements. To this day, more than forty years later, no official will take responsibility for this report. Mexicos Archbishop Manuel Pio Lopez defended Father Fuentes, arguing “that he had preached nothing that would contradict the message of Fatima, nor had he attributed frightening prophecies to Sister Lucy.” The Archbishop of Guadalajara, Cardinal José Garibi y Rivera, also came to Fr. Fuentes defense. Nevertheless, Fr. Fuentes was subsequently relieved of his position as postulator for Francisco and Jacintas beatification causes. In addition to the Vaticans refusal to reveal the Third Secret as requested by Our Lady, 1960 also marked the silencing of the last surviving Fatima seer, Sister Lucy. Following the 1959 publication of Sister Lucys interview with Father Fuentes, (for Sister Lucys comments, see “Silencing of the Messengers: Father Fuentes (1959-1965)“) the chancery of Coimbra issued an anonymous declaration disavowing Fr. Fuentes testimony and stating that Sister Lucy had nothing new to say on Fatima. Afterward, it became increasingly difficult to see Sister Lucy, and for years no more of her writings were published. She was forbidden not only to reveal the Secret but also to speak about the Third Secret at all. She could not, from 1960 forward, receive any visitors except close relatives. Since the silencing of Sister Lucy in 1960, a campaign of lies and distortions has been led against the truth about the Consecration of Russia, so that confusion about the matter abounds. The following instances are just a few examples of the campaign to distort the truth about the Consecration. On March 21, 1982, Msgr. Sante Portalupi, the Papal Nuncio to Portugal, Bishop Alberto Cosme do Amaral of Leiria-Fatima and Dr. Francisco Lacerda were sent by Pope John Paul II to meet with Sister Lucy, to learn from her the requirements necessary to fulfill the Consecration of Russia. She informed them of the requirements for the valid Consecration of Russia according to the request of Our Lady of Fatima: the Pope, together with all the Catholic bishops of the world on the same day, is to consecrate Russia to the Immaculate Heart of Mary. However, the Nuncio did not transmit Sister Lucys full message to the Pope. Bishop do Amaral told Bishop Portalupi not to mention to the Holy Father the requirement that the worlds bishops must participate in the Consecration. After the 1984 consecration of the world by Pope John Paul II, Sister Lucys statements in multiple interviews confirmed that the Consecration of Russia had still not been done. Yet in 1989 computer-generated notes and letters supposedly signed by Sister Lucy suddenly appeared, flatly contradicting all prior statements she had made for more than fifty years about the Consecration. In October of 1990, in a written report, a highly regarded forensic expert established that Sister Lucys purported signature on a November 1989 computer-generated letter was a forgery. Excerpts from this letter, published in an Italian Catholic magazine in March 1990, were being circulated widely and cited as “proof” that the Consecration had been done. Several news wire services also carried the magazines story, thereby helping to spread the fraudulent claim worldwide. There have been countless other acts of sabotage against the Fatima Message, especially as regards the Consecration of Russia and the Third Secret. Yet, though it remains clear that the Consecration of Russia as requested by Our Lady of Fatima has yet to be done, those whose agenda stands in opposition to Fatima continue to do everything in their power to bury Fatima. In July of 1989, Father Messias Coelho, in the presence of three witnesses revealed that Sister Lucy had just received an “instruction” from unidentified Vatican bureaucrats, stating that she and her fellow religious were thenceforward to say that the Consecration of Russia was accomplished by the 1984 consecration of the world ceremony, in which the worlds bishops did not take part and no mention of Russia was made. After this development various persons began repudiating their prior statements that the Consecration of Russia had not been done. These persons had previously clearly maintained, until 1989, that Russia had not yet been consecrated as requested by Our Lady of Fatima because Russia was not specifically named and the worlds bishops did not participate. For more on the distortion of facts regarding the Consecration of Russia, see “Consecration of Russia Disinformation“. Also in 1989, Father Robert J. Fox began his campaign of disinformation about the Consecration of Russia. For details see “Father Foxs Fabrications“ or, for a more complete treatment, see “Father Foxs Modernist Assault on Fatima“. Thus we can see from the above examples that there have been numerous attacks on Fatima, even after its official approval, and that members of the Church hierarchy have led the attacks most effectively. These attacks have taken the form of a subtle undermining of the Fatima Message, especially through distortion and disinformation. De Marchi, John I.M.C., Fatima from the Beginning, (Missões Consolata, Fátima, 1986) p. 227. For a full critical study of Fatima and refutation of Fr. Dhanis’ position on Fatima, see Frère Michel de la Sainte Trinité, The Whole Truth About Fatima, Volume I: Science and the Facts, (Immaculate Heart Publications, Buffalo, New York, 1989) pp. 381-528. This text was published on July 4 in Novidades, the Portuguese Catholic daily. The Portuguese original is quoted by S. Martins dos Reis, O Milagre do sol e o Segredo de Fátima, pp. 126-27. A translation appeared in the Documentation catholique Fátima of August 7, 1960, col. 981-982. Quoted in Frère Michel de la Sainte Trinité, The Whole Truth About Fatima, Volume III: The Third Secret, (Immaculate Heart Publications, Buffalo, New York, 1990) pp. 549-551. Frère Michel de la Sainte Trinité, The Whole Truth About Fatima, Volume III: The Third Secret, p. 578. Father Joaquin Alonso, La Verdad sobre el Secreto de Fatima, (Spanish edition, Centro Mariano, Madrid, Spain, 1976) p. 40. Quoted in Frère Michel de la Sainte Trinité, The Whole Truth About Fatima, Volume III: The Third Secret, p. 591.